Click here to read the full news story. Want more information about the current weather conditions bring termite infestations to the valley? View the helpful termite infographic on how to spot indications of termite activity. Press Release– PHOENIX, Ari., June, 2015- A local Mesa termite removal company is seeing a spike in termite activity throughout the eastern Arizona valley after wet weather conditions continue. Since the rainfall began last week, Tony Kaufman of Varsity Termite and Pest Control has seen a rise in homeowners experiencing winged termites known as the Desert subterranean termite. The Desert subterranean termite is one of the most common subterranean termites found in Arizona. These termite swarmers are typically found living in desert plants including dead cactus, but can also severely affect utility poles, or buildings and other timber structures. The desert termites are most often active during night in the rainy seasons, from July to September, and even more active during rainfall. The dry dirt in the Valley becomes a moist soil playground for these small termites. Termites create small cells within the soil to develop a new colony. A colony of termites can grow as large as 300,000 termites, including various smaller colonies that often abandon themselves to form separate colonies. Indications of a termite infestation can be easily spotted. “The most common indication of termite colonies during rainfall is the mud tubes found within wet soil or shaded areas”, says Tony Kaufman. These mud tubes are shelters created by the worker termites that allow them to gain easier access to a timber food source. The termite removal and treatment team at Varsity has received numerous calls from residents all over the valley noticing these small winged termites, and mud tubes along the outdoor perimeter of the home. Varsity Termite and Pest Control was built on the belief that professional working values matching with complete customer satisfaction builds a lasting business based on happy customers and awesome referrals. 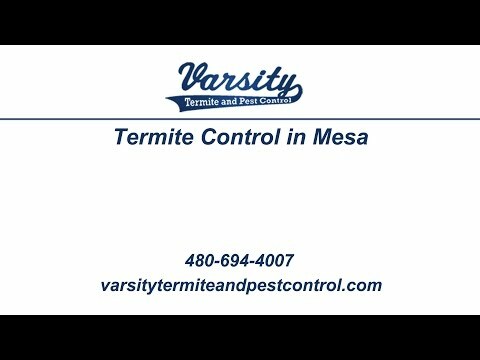 As a family owned and operating company with over 21 years of experience within the pest control industry, our honest and reliable service has given homeowners in Arizona a company they can trust with their most important assets, their homes and their families’ protection from termites, scorpions, and many other common AZ pests. If you’ve noticed any of these termite infestation indications, call Varsity for a free termite inspection from our professional Mesa termite exterminators. You’ll also receive a coupon for $100 termite treatment and removal services.